In January 2003, the company was named one of the “Top Ten Enterprises of Fertilizer in 2002” by the Soil & Fertilizer Working Station of Shaanxi Province. In November 1998, Yangling Jinong’s humic acid fertilizer products won the “Houji Golden Spike Award” issued by the Committee of Yangling Agriculture Sci-Tech Exhibition. In January 1999, Yangling Jinong’s humic acid fertilizer products won the “Certificate for Major Scientific and Technological Achievements of China” issued by the Evaluation and Appraisal Committee of Scientific and Technological Achievements of China. 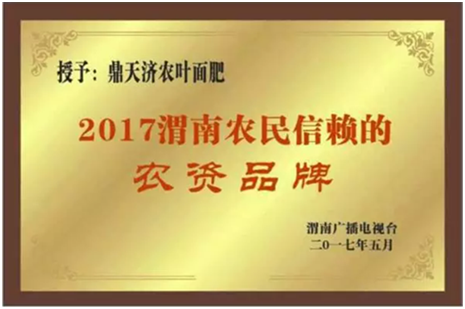 In December 2000, the company’s Humic Acid Organic Liquid Compound Fertilizer Project was recognized as a “Shaanxi Major Sci-Tech Industrialized Project” by the Shaanxi Sci-Tech & Education Leading Group. In 2017, the company was named the most trusted agricultural brand by husbandman in Weinan, Shaanxi. In October 2001, the company’s humic acid organic liquid compound fertilizer was issued a “Certificate of Recommendation for Green Food Production Means” by the Chinese Green Food Development Center. The company was the only enterprise in China’s northwest area to receive this honor. In December 2000, the company received the “Certificate for Hi-Tech and New-Tech Enterprise” issued by the Science and Technology Department of Shaanxi Province. On March 15, 2002, the company was named a “National Outstanding Customer Trustworthy Company” by People’s Daily. In December 2001, the company was approved as a “Shaanxi Province Designated Production Enterprise for a New Fertilizer Type” by the Soil & Fertilizer Working Station of Shaanxi Province.